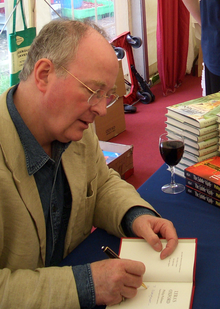 Philip Pullman CBE, FRSL (lahir di Norwich, Britania Raya, 19 Oktober 1946; umur 72 tahun) merupakan penulis English dari Norwich. Dia adalah penulis buku, termasuklah trilogi novel, His Dark Materials, dan biografi fiksi Jesus, The Good Man Jesus and the Scoundrel Christ. His Dark Materials ialah trilogi terdiri daripada Northern Lights (dijudul Kompas Emas in North America), Pisau Gaib dan The Amber Spyglass. Buku Pullman termasuklah karya berikut. Wheat, Leonard F. Philip Pullman's His Dark Materials - A Multiple Allegory: Attacking Religious Superstition in The Lion, the Witch and the Wardrobe and Paradise Lost. Interview: Philip Pullman: new brand of environmentalismThe Daily Telegraph, January 19, 2008, "Paradise regained" Extract from interview with Pullman in Do Good Lives Have to Cost the Earth? Article: Philip Pullman: Kill humans and ration heating The Register, January 21, 2008, ""This is a crisis as big as war"
Article: Pullman criticizes modern fiction The Guardian, August 12, 2002, "Fiction becoming trivial and worthless, says top author".